Instead of the open-floor plan filled with dozens of demo kiosks we've come to expect from its showings, Nintendo's booth at E3 this year looked rather different, featuring a single space shielded from the rest of the showfloor and dedicated to a single game: The Legend of Zelda: Breath of the Wild. 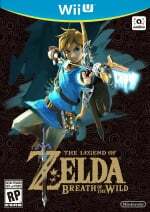 While it may have seemed like an odd choice, after we got the chance to go hands on with the latest Legend of Zelda it all made sense; in the span of less than an hour inside Nintendo's Hyrulian safe-haven, we'd trekked up mountainsides, tiptoed through temples, taken out Moblin mobs by way of arrows, bombs, boulders, and swords, made a cracking mushroom stew, and sand-surfed down a hillside on a wooden shield. Nintendo may have only brought one playable game to E3, but Breath of the Wild encompasses a huge variety of experiences, and we were blown away by our time in Link's new world. In fact, right from the start of both of the on-site demos we tried — one focusing on the game's opening moments and one on exploration — the freedom inherent in Breath of the Wild was crystal clear. 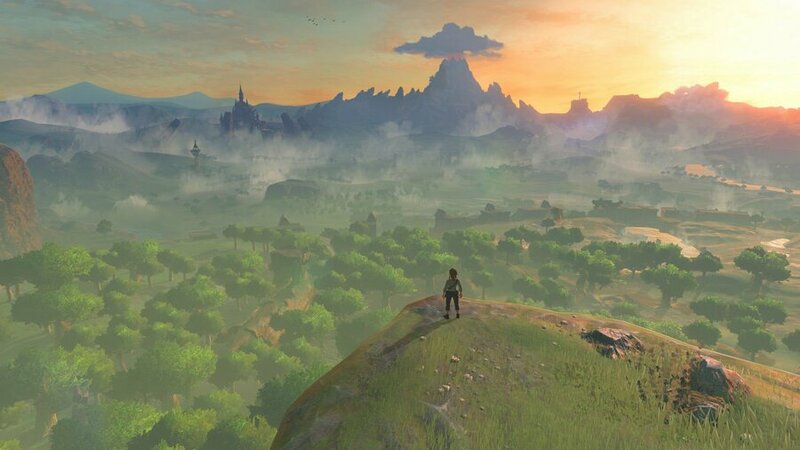 In the first, Link wakes up in a cave, and on cresting the first hill after emerging into the sunlight is treated to a breathtaking view of Hyrule expanding below him. In the second, he finds himself dropped into a forest with a bow, branch and sword, and left entirely to his own devices. Both scenarios, in their own way, showcase the defining theme of this new Legend of Zelda: openness, seamlessness, and an exhilarating sense of exploration. A great deal of that feeling of openness comes, of course, from the open-world design, which made quite an impression on us — seeing a far-off shrine in what would otherwise be the background, and actually making our way there by trekking over hills, across fields and through valleys was striking, and immediately made Breath of the Wild stand out from any other Zelda game we've seen. But equally impressive was how the game's mechanics back-up the seamlessness of that open-world design. Take, for instance, one of Link's new skills for Breath of the Wind, climbing, which lets him scale sheer surfaces with a few taps of the 'X' button. It's tied to a stamina gauge — a contextual circle that drains when Link climbs, sprints, or swims, and refills automatically while he's not — but it's not tied to any particular points in the environment. Rather than designated 'climbable spots', Link can climb rocks, walls, boulders, trees, forts, and absolutely everything vertical we came across in our hands-on time. Paired with Link's newfound ability to jump (!) and world design that thoughtfully emphasizes verticality, it makes Hyrule seem both unfathomably vast and endlessly explorable, and we loved making our way to the tops of tall structures, taking in the surrounding view, and then hopping down to head to parts-just-noticed at full tilt. 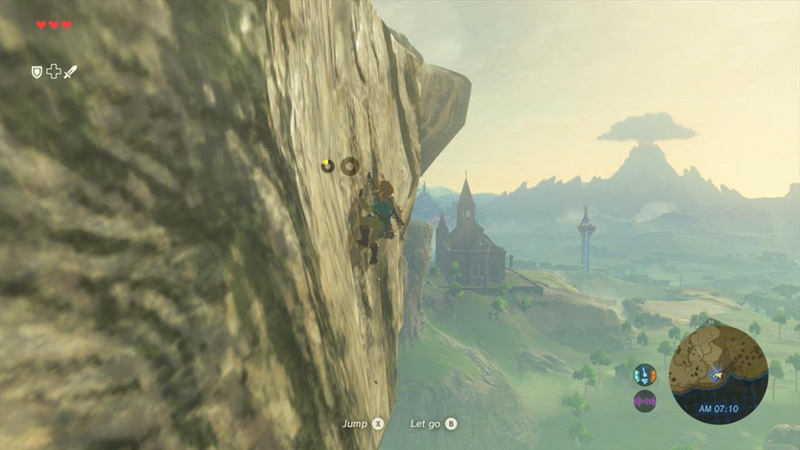 And just as climbing makes Link's world feel entirely accessible, the addition of resources makes it feel so much more alive, malleable, and important. Cut down a tree, for example, and you'll be left with a stump and a log. The log can be split into firewood, which you can combine with flint to make a fire. Start up a fire, and you can set any flammable objects you find alight. Light up a branch to make a torch, and you can fuel a campstove. Fire up a campstove, and you can whip up a stew or a skewer — from ingredients you've foraged for or harvested along the way — to restore Link's health after a battle. Breath of the Wild feels like much less of an abstracted 'gamificaiton' of exploration than previous Zeldas, and more like Link's actually charting his own way and living off the land. We loved playing with what we found in Link's surroundings to create these serendipitous chains and, like climbing, the best part about this is that it 'just works' to the point that it feels wonderfully organic. We'd seen Link cut down a tree with an axe in the trailer, but were pleasantly surprised to find that a sword will do the job just as well — as it should, of course, but it's another detail that makes Breath of the Wild feel like much less of an abstracted 'gamificaiton' of exploration than previous Zeldas, and more like Link's actually charting his own way and living off the land. That feeling kept surprising us as we played, too. In one early fight with Moblins that left us low on health — entirely our own fault, and the result of some poorly-timed bomb detonations — we instinctively started looking around for hearts in the grass. It was only after a few frantic moments of impromptu lawn maintenance that we remembered we wouldn't find any, and so we headed towards a grove to look for health-restoring apples instead. Egged on by our Nintendo rep and intrigued, we threw them on a fire to turn them into 'baked apples', which restored more health than they would have raw. It sounds like a small difference, but foraging for food instead of searching for magical organs was so much more involving, and we loved the change. Even in our brief time with the game, we kept getting happily lost and sidetracked with small quests like these — find an apple, see how high up we can get here, see if we can eat those mushrooms — and we can see ourselves spending many enjoyable hours the same way in the full game. Of course, even for all its organic grounding, Breath of the Wild is still a game, and we're happy to report that in that respect, it feels wonderful so far. The controls shake things up a bit from other Wii U Zeldas but are instantly comfortable; 'B' performs a dash, 'Y' attacks with the equipped weapon, and 'X' is used for jumping and — when combined with the left analogue stick — climbing. 'ZL' stays on as Link's targeting and shield, 'L' uses items, 'R' throws weapons — as we discovered by accidentally slinging our sword — and 'ZR' is a dedicated arrow-shot. Item selection is handled by holding up on the D-pad and choosing with the right analogue stick, which threw us for a loop at first, but proved to be a pleasantly speedy combo in the thick of battle. Speaking of battle, what we played in terms of combat was excellent. The openness of the world was mirrored especially in the open approach to dealing with enemies, and we ran through the gamut; in our various encounters with Moblins in the demo, we approached them head on and sliced away with a sword or axe, we stood above them and lobbed some of our unlimited bombs their way, detonating them when they came near, we rolled boulders off of ledges and squashed them with gravitational might, we snuck past and ignored them entirely, and we lit adjacent objects on fire and hoped for the best. The clear highlight, however — even for a pacifist like this writer — was the bow and arrow. Using 'ZR' to zoom in and a Splatoon-like combo of the GamePad's gyroscope and the right stick to aim felt wonderful, and aiming for headshots — which deal the extra damage you'd expect — was incredibly satisfying. The GamePad also seems to be put to good use elsewhere in the game, particularly as a real-world proxy for Link's helpful Sheikah Slate. The biggest use of this device in the demo was to serve as a Xenoblade Chronicles X-style interactive map, which, like the land it charts, scales beautifully. When we zoomed out fully on the suggestion of our Nintendo rep, we got an almost overwhelming sense of the vastness of the explorable world, but even better, when we zoomed in, we were treated to a topo-map display that showed distances and depths in lovingly-lined detail. The cartography is customizable as well; you can set 'stamps' anywhere on the map — using either the top-down plan or a first-person scope — and choose from a variety of symbols and colours to represent whatever you'd like to remember. Finally, we also used the GamePad to scan in a handy Wolf Link amiibo, which brought in the hairy hero as an AI-controlled canine companion who howled and ran alongside us. 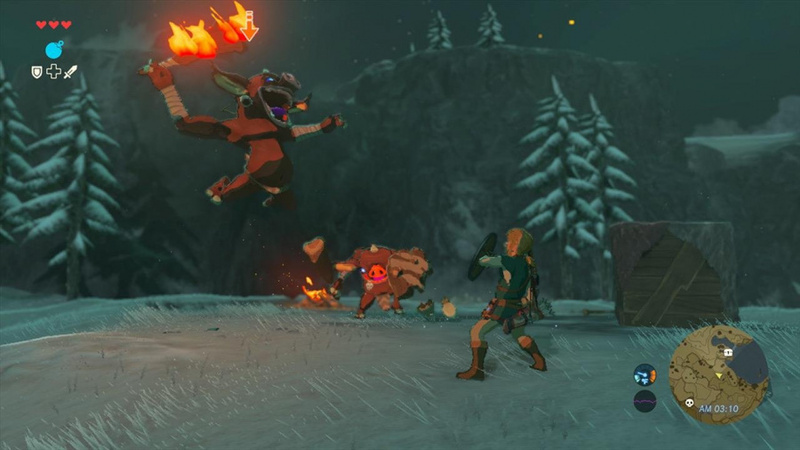 Though we didn't get to really put him through his paces, we love the idea, and it looks to be a really fun feature — we can't wait to take Wolf Link on extended adventures across Hyrule. From mobbing Moblins to mountaineering, we had a blast with what we played of the game's mechanics, but more than anything, playing Breath of the Wild conjured up an incredible feeling of exploration. From mobbing Moblins to mountaineering, we had a blast with what we played of the game's mechanics, but more than anything, playing Breath of the Wild conjured up an incredible feeling of exploration. A large part of that was down to the sound design, which represents a sea change from previous Zelda games; we put in headphones for our demos, and rather than the familiar Hyrulian tunes we've learned to hum over the years, were treated to an incredibly immersive, dynamic soundscape. Both demos began with only ambient sounds as music; the wind whistling, distant water rushing, and grass brushing out of the way as Link ran through it. As we approached a crumbling temple, however, and almost without noticing it, melodies began to lilt in and out of focus; Satie-style shimmering piano and calmly Celtic chords provided an eerie, atmospheric accompaniment to our exploring, and then, as we left, vanished just as swiftly and subtly again, replaced by bird chirps and tree rustlings. The graphics certainly help that feeling too; Breath of the Wild looks lovely, with a watercolour softness that gives it its own style, and demonstrates impressive technical performance — especially considering its ambitious vistas and the Wii U hardware it was running on. We didn't come across any noticeable framerate drops or pop-in, and we were particularly charmed by the animation; Link's shivering in the cold and stirring up stew were full of personality, and transitions between actions felt impressively seamless as well. In an early portion of the first demo, we ran up to a cliff's edge, leapt off, landed in a lake, swam across the water, and climbed up a rock face to get out on the other side, all in one smoothly-animated chain of motion. 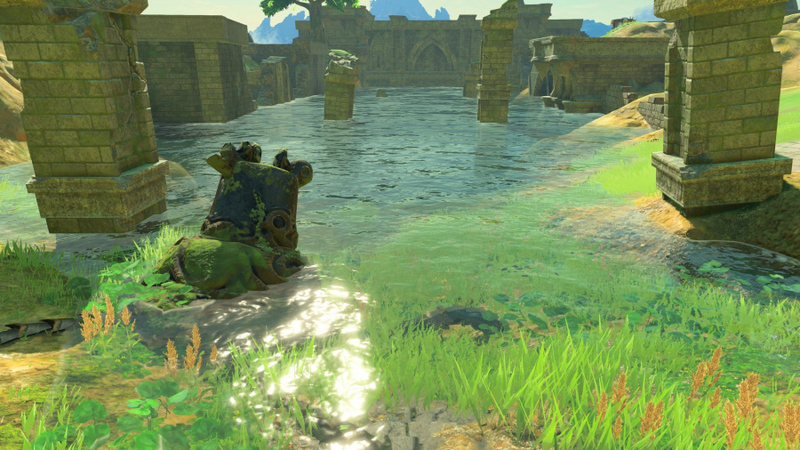 We also really appreciated how items and resources blend into the environment, rather than standing out; periodic glimmers of light will point you towards items to pick up, but there's no conspicuous cel-shading, outlining, or any other visual indicators that they wouldn't be there if Link wasn't. That may sound like a small detail, but it makes a big difference, and that was a consistent theme in our time with Breath of the Wild. From the fireflies that appear at night to plants brushing out of the way as Link steps through them, from the flocks of birds that fly overhead to the new treasure chest theme — which keeps the iconic rhythm and scale but switches up the melody slightly, as if to harmonize the one that's already in your head — these little details really add up to something special. Even with all we saw in these demos, there's still so much more to explore with Breath of the Wild, both in the rest of the game's world — our Nintendo rep told us our demo represented 1% (!) of the final game's geography — and in terms of its features and content. We still know almost nothing about the story, for instance, or how the traditional item-based puzzle chains will come into play (if at all); we don't know what the mission structure will look like, what familiar faces we'll see, or where this new world fits into the series' lore. What we do know, however, is that after our handson time with this re-imagination of the Legend of Zelda, we're beyond excited to find out. I don't even know how I'm going to cope until March 2017. I have been blown away by what I have seen so far. This appears to be as much a change to the series as LoZ:OoT was. I am itching to get into this world now and just see what stupidity I can cause in it.
" That may sound like a small detail, but it makes a big difference, and that was a consistent theme in our time with Breath of Wind"
Nice read. How huge is it compared to XCX? I'll spend minimum 50 hours on exploration alone like I did on XCX on foot for sure. The game looks even more fantastic than I even hoped for. I will be curious to see how the NX version handles the map vs the gamepad though. I see some Chinese Whispers going on. So far we've had 2% and 1% reported. It probably started off back at HQ as 21%, and before the week's out people will be reporting it represents 0.000001% of the world. Whatevs, just give me the game, you can have my life in exchange. Welcome back to the modern gaming world, mainline Zelda. Enjoy your stay, a lot has changed while you've been gone lo these 6-7 years. Just don't fall prey to Daggerfall/Twilight Princess "barren landscape" syndrome, and you'll do fine. @Darknyht no kidding, that's the best part of the Elder Scrolls titles. 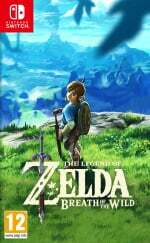 It all looks and sounds fantastic and it'll be an absolute joy to play but it's hard to feel hyped for it when it's release is still so far away.There's also the fact I don't even know if I'll play this on Wii U,if it turns out the NX version looks better visually ,that'll be the version I'll want to play. Actually, March 2017 is NX's launch date, the game itself is targeted for a vague "2017". For all we know, it could launch late in the year (as is tradition for highly anticipated games for Nintendo). It'll be March 2017 unless the NX gets delayed. It'll just be Twilight Princess again. Both versions on the day the new system launches. They aren't going to release a game for the Wii U after the NX has already been out for several months. Cheers to the writer of this article for being very descriptive! @ThomasBW84 Weird I keep calling it breath of wind too! Just being cautious. You know, to avoid disappointments. But you've got some solid logic there. You can beat the game without doing the story it seems. You can just go to the final boss beat it and be done with the game. I'm curious as to how link will increase his hearts now. The usual replenishment method of being your own landscaper is gone. So does that mean gaining a new heart by beating a dungeon boss is also gone? would it be more along the lines of the new system and you craft yourself a new container from the remains of the dungeon boss? If there's another delay....I'm not sure I'd survive. @MarinoKadame Or you need to beat a number of shrines before you're able to tackle the final boss. There's no reason why the story has to block the final boss and not some other thing. I think heart containers will remain as normal. Full hearts after dungeons. Pieces after completing certain shrines and maybe a few scattered about in the world as usual. I'd like it to be that way at least. They're making some pretty colossally huge changes, but let's not change everything! @A01 I wouldn't be surprised if it wasn't the usual method. I sort of expect it but like you, i wouldn't mind it remaining as it was. After getting home and finally being able to watch all they showed I'm floored. I know we have a ton of open world games, but this just feels different. I absolutely adore the art style, feels like an open world Miyazaki anime I can go whole hog on. Let's hope it releases day and date with NX and that NX does release in March. Honestly, between this and XCX I could see myself being lost in my Wii U for months at a time and enjoying every moment of it. I know its place in Nintendo's history but so many things about the Wii U mesh with me and 1 or 2 more of the right games from Nintendo and a couple extra 3rd party games would make it my favorite console of all time. I know that they want to show it, but I'm a bit worried but how the world, while gorgeous, looks so lifeless. That said, I really want to see it running on NX!!! Still looks like it's sparse of enemies! Still waiting on the hook, gimmick, mechanic. Game was supposed to be out last year in 2015, then this year in 2016, now not until whenever in 2017 (no reason to believe March when everybody at Ntinedo has already been wrong twice) so I think it's past time they show us more of the game than just nature. Nature was good at E3 in 2014, and Epona in Dec 14, now I want to know about the game, not just the game engine. We should be getting way more than just a glorified tech demo at this point. It's not about how long until the games comes out, it's about how long ago the game was announced and supposed to come out. That top pic, while being firstly reminiscent of the main opening shot in XCX, makes me want a flight mechanic. Not a skell, Kirby already did that, but the world is so vast, let us get around w/ a birds eye view. And not just drifting down on a leaf, I want to fly around and take it all in. My first choice is a hot air balloon. If ever a game adn a series was made for the slow-mo travel of balloon flight it was this one. If only for IGN to say "too much air". And if I can't get a balloon, give me that wild breath and a cloud, or parachute. But I want lazy relaxing controllable flight over all the land. Balloon works the best though as the game can force you to land at only certain spots, as most games do w/ "Fast travel". Guess it wouldn't need to be compeltley controllable, but I want the view. Also need a reason. Ganandorf conquering the world may be a given, but is it an invading army, killing nature, destroying the planet, flooding the place? Breath of the wild makes me think some type of natural destruction, but I want to know what it is we're fighting. So far the thing I liked the best is the wolf Link amiibo. Life is best w/ a pet. As limited and DLC as that pet may be. I think that you only need the amiibo, the cave of shadows just gives wolf link more hearts. I doubt I'll be able to play the game without Wolf Link. That feature looks like the best use of Amiibo yet. This game simply looks amazing. This is why I never doubt it when Nintendo delays games. Yes, a part of it was for the NX version, but they never stop tinkering with game design, and it looks like they just hit a 600 foot homer out of the park. @NickOfTime90 Thanks, that seems to be the new consensus, 3 hearts out of the box, and I can live w/ that as I wanted to buy the amiibo anyway, just waiting for it to be sold separatly. This game will sells NXs like Hot cakes ! @rjejr here in europe it already is available apart from the game. I really don't understand the differences in releasedates. @NickOfTime90 At retail, or just people reselling it on eBay? I'm sure I could find a used one somewhere if I really wanted to but I like my stuff new. My wife works a couple of blocks from Ntinedo NY, I'll have her go ask there. Though w/ the Zelda demo this week I'm sure they're all sold out if they did have them. She won't go anywhere near the store until after E3 though, large groups of nerds bother her. Please tell me that it will be significantly enhanced for the NX in terms of visuals. It looks fine here, but it definitely looks like it's running on an underpowered system. This game looks absolutely stunning. I've replayed the trailer way too many times and to think the treehouse footage was only 1% of the whole game... incredible. I can't wait to get this day 1 for the NX, I'm so excited! I'm speechless...What a shift in direction! Can't wait! Honestly, this became my most anticipated game at the moment! Cannot wait hhnnngghhhh!! If Nintendo puts similar effort and passion to all their future games, then the NX generation should be nothing short of amazing! It's funny how the game's genre is marked as "Open-Air Adventure" on the official page! The hype could not be more real. As long as they can nail a great character driven story like Skyward Sword...this will be so freakin' incredible. I would preorder it now but I kind of want to wait until I hear more about the NX. I know I will be getting the system either way so if there is even the slightest improvement in the NX version I may as well wait to get that one. The world looks so alive. Game looks to have the potential to be a masterpiece. The footage I saw was stunning and incredibly fun looking. Also, what a huge departure for the series! @rjejr A hot-air balloon is out of the picture considering how many Moblins you'd have to skin. I'd rather fly on a giant peregrine falcon. Soaring through the skies of Hyrule at up to 110 miles an hour! Massive game too explore and adventure in. @rjejr I saw it new at a gameshop in town. I already got mine with the game but i remember thinking, heh so they are selling them seperate now. Is she scared for a zombie nerd apocalypse? @TheWPCTraveler Did you see my Hobbit eagle flying post in the other thread? I'm old though, I want Link to kick back w/ an alcoholic beverage and take in the sights at a leisurely pace. @NickOfTime90 No, just nerds in general. I don't even like zelda games but this looks like it could be the best game ever . From both the trailer and gameplay I got a mix of familiar feelings of other (not gameplay, more nostalgic), Nausicaa, Shadow of the Colossus, and strangely enough Journey. Oh man, I hope they don´t delay this again. I really can't wait for March! From all I've seen, I'm really excited. It looks like what they have there is a pretty finished version. March still isn't an absolute. This game could be that 'killer app' that the VR market needs. THIS is the Zelda I've been waiting for. Open, beautiful world to explore, no hand holding, that hopeful retains the magnificent puzzle solving gameplay of past games. Simply can not wait. If it does release as expected next year then March & April are going to be very busy alongside Horizon Zero Dawn. Good times. @Shigmin That works on so many levels. Well, like two, but it's still great, haha! @Tsurii the ultimate red pill. @Haru17 I'm pacing up and down outside Gamestop right now, going "CMOOOON.... CMMEEEEEEN"
Guys...I really really hope that Loftwings or some form of flying transportation exists in this game. I know there's the paraglider, but how cool would it be to fly. Your next Switch time sink?